Pictured at the opening of the Craft Village are Mayor Niall McNelis, Hazel Hendy, and Roger O'Sullivan. Handcrafted jewellery, paper quilling artwork, baby knitwear, decoupage, ceramics and wooden crafts are just some of the stunning pieces on offer at the brand new Glass Factory Craft Village at Galway Irish Crystal. 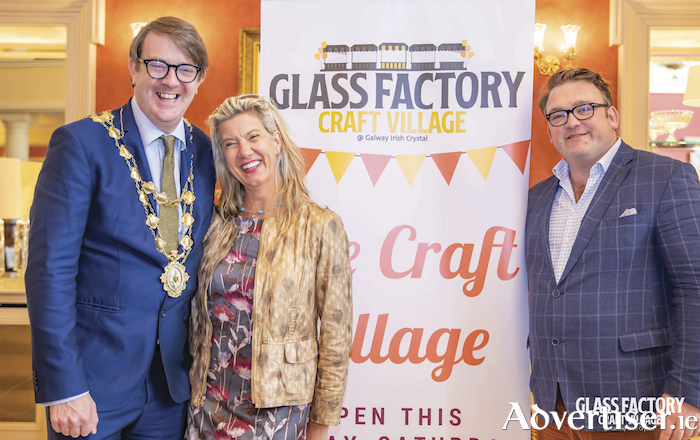 On Friday afternoon last, the Mayor of Galway, Niall McNelis, attended Galway’s newest attraction to meet the makers, hear their stories and officially open the new Craft Village. Located at the Galway Irish Crystal building on the Old Dublin Road, the Glass Factory Craft Village offers a stunning collection of locally designed and produced products, with many of the stall holders availing of the opportunity to work on their designs in situ. This hands-on element is a welcome addition, allowing shoppers to order custom-made pieces. The Craft Village was the brainchild of local businessman Roger O’Sullivan, who is passionate about the heritage and culture of Galway City and County. “There are so many amazingly talented producers, designers and craftspeople in Galway who, for one reason or another, do not have a direct route to market. The Craft Village opens up a new local, national and international audience for these producers,” Roger explained. The Glass Factory Craft Village is open every Friday, Saturday and Sunday from 10am to 5pm and plans are afoot to develop the Craft Village into a Christmas Craft and Gift Village which, of course, will include Santa’s Grotto.